To determine the age of the coatings, Dr. Susan Buck undertook two rounds of analysis on six of the stucco fragments that had the most intact patches of whitewash. While Susan Buck found surviving finishes on five of the six fragments, only one fragment retained a full record of the columns' finish history. That sample, SB-Arch-4, included four layers of whitewash applied over a lime-plaster render. While the other four samples also featured a lime render and/or traces of whitewashes, SB-Arch-4 had by far the most complete paint history. 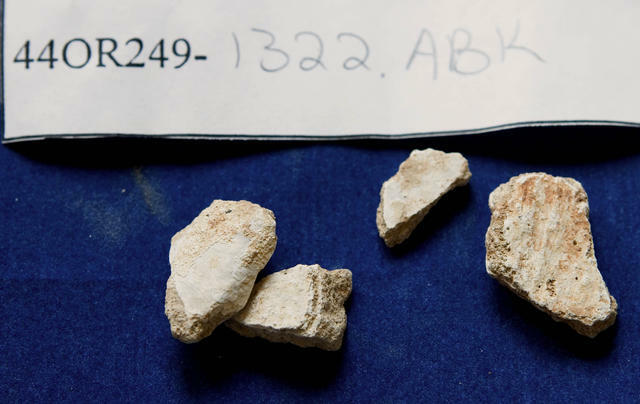 Some of the stucco fragments analyzed by Dr. Susan Buck.